Winter is the perfect time of year to kick back and enjoy some warm soup with family and friends, so it’s appropriate that January is National Soup Month! If you’re craving that warm cozy feeling, then you’ll want to try one of the many delicious soups we have available at both Disneyland and Walt Disney World Resorts. At Disneyland Park, you can find some delicious chicken gumbo at Café Orleans in New Orleans Square. 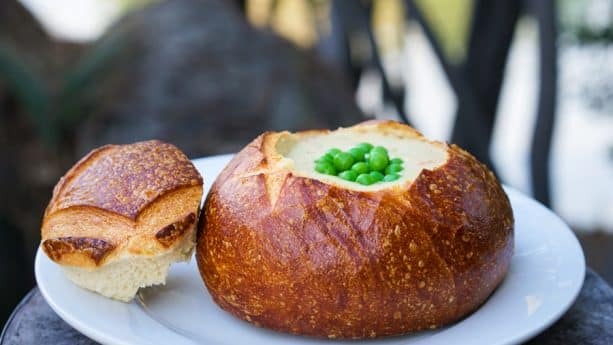 And at Harbour Galley in Critter Country, you’ll find some classic cheddar broccoli soup, clam chowder and a seasonal soup, which currently is a chicken pot pie. What’s even better is that all of these are served in sourdough bread bowls! 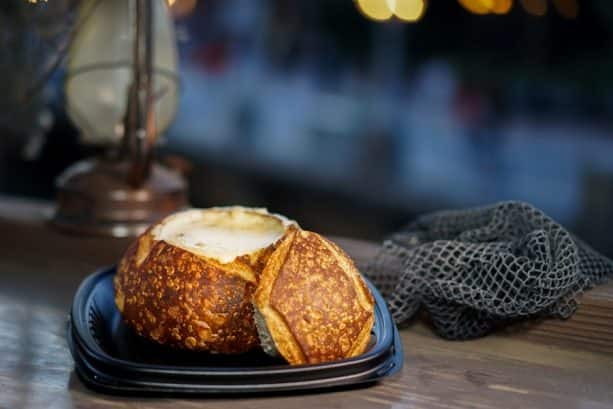 You can also find sourdough bread bowls at Pacific Wharf Café in Disney California Adventure park, which features clam chowder, broccoli and cheese, and loaded baked potato soups. 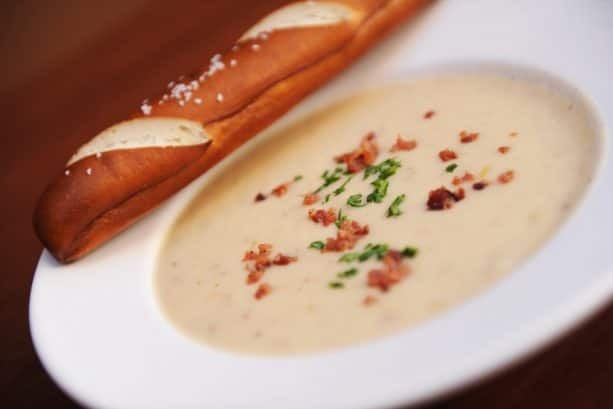 In addition, Carnation Café is currently offering baked potato soup with bacon, cheddar, Monterey Jack, sour cream and chives. And if you’re dining at Carthay Circle Restaurant, you won’t want to miss the soup of roasted parsnip accented with winter pears, dried cranberries and rosemary ham. 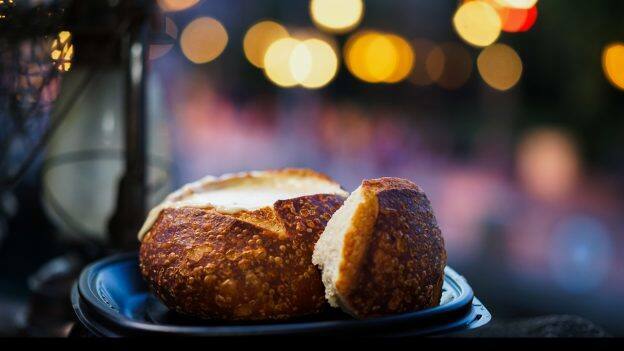 Here on the east coast, Walt Disney World Resort has some delightful soups of its own, like the famous Canadian Cheddar Cheese Soup that can be found at Le Cellier Steakhouse in Epcot. This soup is made with Moosehead Beer and applewood-smoked bacon and pairs perfectly with pretzel bread. This cheddar cheese soup can also be found at Refreshment Port in a smaller, on-the-go portion! If you travel to the China pavilion and visit Nine Dragons Restaurant, you’ll find some delicious hot-and-sour soup. Or take a stroll to The Land to visit Sunshine Seasons, where you can pick up some beef chili, pumpkin squash soup or roasted tomato soup. In Magic Kingdom Park, you’ll find some tasty New England clam chowder and vegetarian chili at Columbia Harbour House in Liberty Square. And over in New Fantasyland, if you’re dining at Be Our Guest Restaurant, you’ll find one of my personal favorite soups – the French onion soup topped with a crouton and Gruyère cheese for both the lunch and dinner periods, also vegetarian! For lunch, you’ll also find Potato Leak Soup on the menu, while on the dinner menu you’ll find delicious a lobster bisque served with crème fraîche. And just a quick monorail ride away, Disney’s Grand Floridian Resort & Spa has their own traditional French onion soup – Caramelized Onion Soup Gratinée, which can be found at the Grand Floridian Café. Other dining locations with gourmet soups include The Turf Club Bar and Grill at Disney’s Saratoga Springs Resort & Spa, where you can order a creamy forest mushroom soup with herb oil and shiitake mushrooms. And at The Hollywood Brown Derby in Disney’s Hollywood Studios, you’ll find an Florida Tomato Soup served with a Cotswold cheddar fritter. On safari at Disney’s Animal Kingdom? Stop by Tiffins to try their butternut squash soup with coconut-curry poached Key West pink shrimp. Or if you’re staying at Disney’s Animal Kingdom Lodge, then you’ll be excited to find that Boma – Flavors of Africa has 13 different authentic African soups and stews, including Ghanian Oxtail Stew and spicy Nigerian peanut soup – yum! So come on out and enjoy all of these delicious soups that our Disney Parks have to offer, and Happy National Soup Month! My wife would say the best French Onion soup ever eaten is at Chef de France. None better anywhere. My husband loves all the soups at Boma and is a fan of the potato leek soup at BOG as well. Just wanted to add that CHH used to serve the clam chowder in a bread bowl but did away with it many years ago. You missed the fabulous Tomato soup at Sanaa!! We get it every time we go there! My life would be complete if Columbia Harbor House offered its clam chowder in one of those bread bowls. National Soup Month hype! You somehow managed to miss the best soup on property: the mushroom bisque at Artist Point!